A report of BioSysBio 2009, the IET conference on Synthetic Biology, Systems Biology and Bioinformatics, Cambridge, UK, 23-25 March 2009. The fourth meeting in the BioSysBio conference series brought together international researchers in the interacting disciplines of synthetic biology, systems biology and bioinformatics. This conference was largely student-run, and as well as the formal talks included workshops, discussion sessions and a panel session on ethics, public engagement and biosecurity. A wide range of topics was covered at the conference, including modeling, biofuels and environmental bioremediation, metabolomics, structural and computational genomics, and software tools. Of note were the number of groups presenting improved models of metabolism, studying cellular subsystems such as cell death and circadian rhythms. 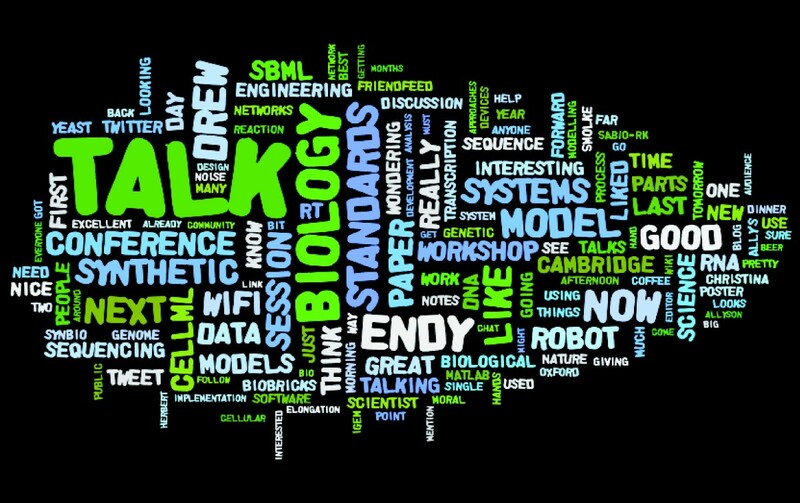 Others are developing new approaches and standards for systems and synthetic biology, and significant improvements were reported for Systems Biology Markup Language (SBML) and the MIT Registry of Standard Biological Parts. A few highlights of the meeting are given here. Synthetic biology is a newly emerging field, where biological components are reengineered to provide new, designed functions. In a keynote lecture, Adam Arkin (University of California, Berkeley, USA) discussed the origins of synthetic biology and its scalability, as well as the engineering challenges that lie beyond the bioreactor. In his view, using synthetic biology, whether to meet an engineering or biological challenge, can be transparent, efficient, reliable, predictable and safe, unlike other human interventions such as selective breeding and the introduction of non-native species. Arkin also described ways of reducing the time and improving the reliability of biosynthesis, such as the use of standardized parts, computer-assisted design, and methods for quickly assembling parts. Evolved systems are complex and subtle, and he highlighted the fact that synthetic organisms need to deal with the same uncertainty and competition as do existing organisms. Among the 'parts' required in synthetic biology are switches that can function, for example, as regulators of gene expression. Christina Smolke (Stanford University, USA) presented novel design strategies for constructing RNA-based molecular switches that can function as both biosensors and ligand-controlled regulators of gene expression. Binding of the appropriate ligand leads to a regulated conformational change in a designed RNA molecule, which in turn can be linked to an appropriate readout signal, enabling these molecules to act as sophisticated cellular biosensors. She also described how such riboswitches can be used as targeted or 'intelligent' therapeutic molecules for treatment of cancer, allowing them to be carefully tuned to respond as a precise set of molecular stimuli. Given the recent explosion in the number of approaches to synthetic biology and the amount of data at the interface of genomic and systems biology, there is now an over-whelming need to organize these data efficiently in appropriate repositories. An update on current standards for DNA description by Guy Cochrane (EBI, Cambridge, UK) focused on the different raw sequencing formats available and, in particular, the work that is being done at EMBL to integrate them, via SRS. In an overview of standards and improvements in SBML language, which is the platform for most software in systems biology, Herbert Sauro (University of Washington, Seattle, USA) emphasized the need to incorporate multi-compartment models into the existing framework of SMBL. Randy Rettberg (Massachusetts Institute of Technology, Cambridge, USA) provided an overview of the publicly available synthetic biology repository being developed at MIT http://partsregistry.org/Main_Page as a result of contributions from participants in iGEM - the international genetically engineered machine competition. Because of the complexity of biological systems, it has always been a challenge to develop predictive dynamic models that are sensitive to changes in biological inputs, but at the same time robust to technical noises. A variety of approaches were described at the meeting. Using a Bayesian framework to study the inferability of model parameters under experimental noise, Kamil Erguler (Imperial College London, UK) introduced sensitivity profiles to identify the relative impacts of changes in parameters on the global dynamics of biochemical models. This analysis revealed the degree of robustness of inferences drawn from different parts of biochemical pathways and thus provides a guide to improved data collection. Andre Ribeiro (Tampere University of Technology, Finland) has developed a delayed stochastic model to investigate the stepwise elongation motion of RNA polymerase and its pauses during transcription. He showed that transcriptional noise level was affected by the durations of the pauses, which could in turn be intrinsically encoded within the DNA sequence. Another challenge is to store all the information being generated by all the -omic sciences. Catherine Lloyd (Auckland Bioengineering Institute, New Zealand) described the language CellML, which is written in XML and uses existing formats such as MathML and RDF to describe biological models of cellular function. The CellML model repository has over 380 models, free to download http://www.cellml.org/. CellML has a number of other useful features, including modularity and the sharing of components such as entities and processes. Ulrike Wittig (EML Research, Heidelberg, Germany) presented SABIO-RK, a database of information about biochemical reactions and enzyme kinetics. The reactions in the database are mainly taken from the Kyoto Encyclopedia of Genes and Genomes (KEGG) and the literature, and the kinetic data comes from the literature. SABIO-RK can be accessed via both a user interface and web services http://sabio.villa-bosch.de/. Recent improvements include a new data model for SABIO-RK that allows the storage of intermediate steps in a reaction, making SABIO-RK the first database to offer kinetic information for both biochemical reactions and their individual steps. DNA synthesis and sequencing comprise one of the cornerstones of modern biology, and Tuval Ben Yehezkel (Weizmann Institute, Rehovot, Israel) described new strategies for synthesizing completely de novo DNA fragments using single-molecule PCR in a completely automated fashion. Single-molecule PCR can be readily scaled up, and will complement the highly parallel DNA sequencing technologies such 454 and Solexa sequencing in the future. Steve Oliver (University of Cambridge, UK) and his colleagues have taken automation even further, describing an automated experimental system to study yeast metabolism. He and colleagues have designed a robot, called Adam, that uses abductive logic programming (ALP) and is capable of reasoning about hypotheses and data, designing experiments to test the hypotheses, and then carrying out those experiments and interpreting the results. Scientists in all fields have a duty to consider the public impact of their work and the conference included a lively panel discussion covering ethics, public engagement and biosecurity. Drew Endy (Stanford University, USA) asserted that while the basics of genetic engineering have not changed in more than 30 years, synthetic biology is revolutionary. He raised the question of people trying to 'hack' genomes in their garage: how should they be managed, if indeed they should be managed at all? He also described how the patent system is flawed with regard to synthetic biology; for example, patenting the BioBricks registry of DNA parts encoding basic biological function would be expensive and counterproductive. Matthew Harvey (Royal Society, London, UK) cautioned that we should not assume that the public must be engaged: sometimes the public simply are not interested. In contrast to genetically modified organisms, there are no synthetic biology products queuing up to be sold right now. Therefore, questioning the public about synthetic biology is currently less like traditional public engagement and more like social-intelligence gathering. Two concerns were discussed by Julian Savulescu (University of Oxford, UK): that synthetic biology may pose risks in terms of malevolent use, and that the use of synthetic biology might undermine the moral status of living things. For regulators, the challenge is to minimize the risk of malevolent use. For scientists, it is to make better predictions about how research will be used in the future. For philosophers, the challenge is to ascertain criteria for moral status, and determine how to weigh the risk of future wrongdoing against the benefits of pursuing research in synthetic biology. Piers Millet (UN Biological Weapons Convention Implementation Support Unit, Geneva, Switzerland) invited scientists to work with security people to prevent bioterrorism. He highlighted that this engagement needs to be bottom up, not top down, and that his organization could help. A new feature for BioSysBio 2009 to extend participation in the conference was to a wider audience by communicating live content through microblogging (using FriendFeed and Twitter; Figure 1) and live blogging (providing an immediate and permanent log) http://themindwobbles.wordpress.com/tag/biosysbio-2009/. The fields covered by the conference are still developing. Researchers are opening up new topics, discovering that mathematical, physical and engineering concepts apply to ever more biological problems. The new generation of researchers increasingly see themselves as forming a new discipline, and while this is exciting, they must ensure that they do not cut themselves off from either of the 'parent' disciplines, the physical sciences (including engineering) and the biological sciences; in particular, more traditional biologists do have important knowledge to convey and questions to pose. However, the results reported at the meeting show that, in most cases, the best from both disciplines is being matched - and exceeded. Word cloud of the contents of the BioSysBio Twitter feed, identified via the search term "#biosysbio". The size of each of the words corresponds to their usage frequency. Image generated using wordle.net by Simon Cockell http://www.flickr.com/photos/sjcockell/3389493857/. Licensed under the Attribution 2.0 Generic License http://creativecommons.org/licenses/by/2.0/deed.en_GB.